On Friday March 8, newly-opened Desert Mountain Brewing will host its Grand Opening Celebration. Featuring music by Grandma's Little Darlings and pouring their first beers: Bad Marriage Blonde, Two Ocean IPA, and Siyeh Stout. Shawn and Kelley Christensen moved to the Flathead Valley for the great hiking and decided to stay for the beer. They decided the great little town of Columbia Falls could really use a brewery. Desert Mountain Brewing is about more than handcrafting great beer in the mountains - it's about contributing to the community with a product the locals will be proud of, through give-back programs like the Benefit Brews, by attracting visitors passing through Columbia Falls on their way to Glacier National Park, and by giving a generation that is both connoisseur of beer and cultivator of family a comfortable place to stop for a craft beer, a rootbeer and a board game with the kids. Desert Mountain Brewing is thrilled to be the closest brewery to Glacier National Park. 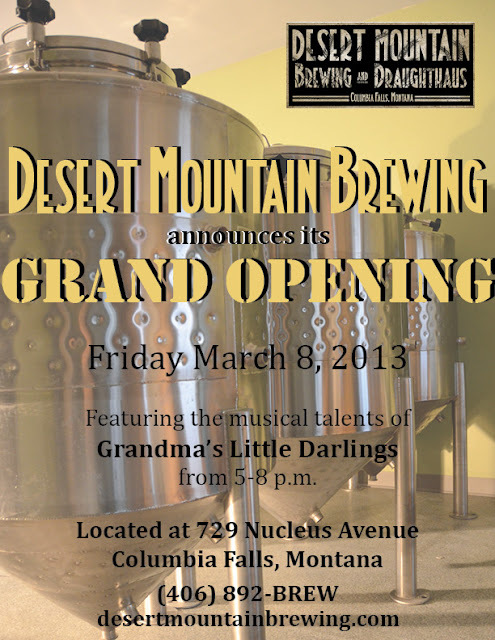 The DMB Draughthaus is conveniently located in the new Cosley building on Nucleus Avenue, downtown Columbia Falls. Daytime childcare is located downstairs at Outside Kids, and fabulous Montana-Italian dinner fare is located right next door at the Three Forks Grille. This is very useful information on desert mounting brewing party. Couple of months ago, arranged a wine tasting party at one of beautiful San Francisco event venues. All my friends gathered there and we had an amazing time at this party.